Finding myself in Milan after nearly a year of long-distance trekking, I couldn’t pass up the chance to walk on water. 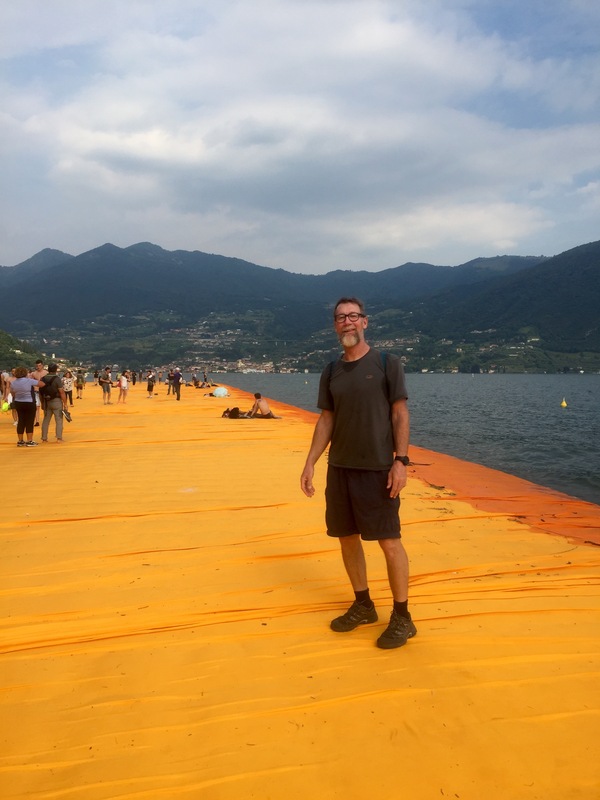 Christo’s latest large-scale installation–the Floating Piers–was open on nearby Lake Iseo. Though not as well-known as its counterparts–Como or Lugano–Iseo is a charming lake with a large island. Instead of the usual ferry, the Floating Piers provides travelers with a bridge from the mainland town of Sulzano across to the island. The lake is in a quiet wine district, and Christo’s installation threatens to overwhelm the region’s infrastructure. Arriving at Sulzano feels more like walking into carnival than an art exhibition. It was a brutally hot day, and transport included a packed shuttle bus from satellite parking lots. Given the difficulty of travel and temperature, the visitors were in remarkably good humor, each showing a quiet expectation or maybe just plain curiosity about what they were about to experience. Christo’s installations tend to be visual–the many draped buildings, his wrapped islands, and the canyon curtain–so The Floating Piers is a divergence. It is participatory, a set of bridges that are meant to be crossed by walkers, pilgrims of all types learning to walk on a strange cloth-covered contraption. The installation was first conceived in 1970 by Christo and his collaborator Jeanne-Claude. A three kilometer set of bridges, it links Sulzano with the island town of Peschiera Maráglio and the tiny Isola di San Paolo. 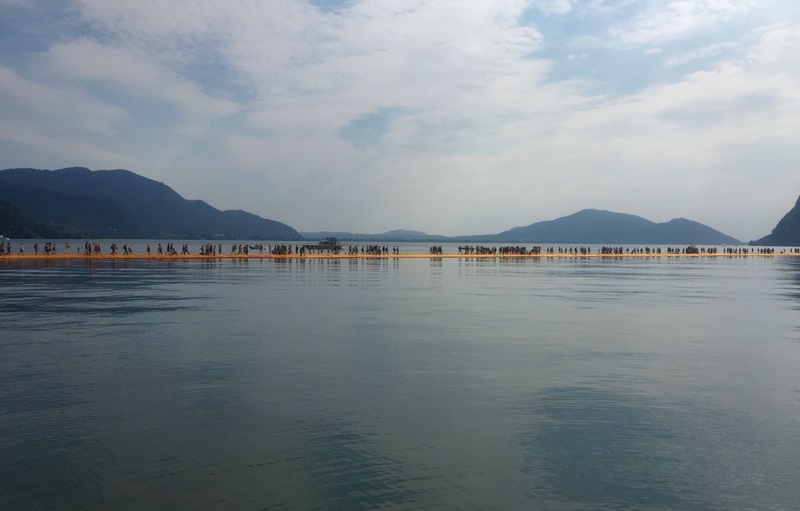 Open from June 18 until July 3, Floating Piers is 220,000 high density polyethylene cubes covered by 100,000 square meters of fabric and held in place by 200 anchors. With a color that approaches school-bus yellow, the bridges float just above the water’s surface with edges tapering to a zero point where the water laps and, on a hot day, invites. The site and surrounding towns have been overrun with walkers. In the first five days alone, 270,000 vistors arrived, far exceeding all estimates and prompting nighttime closures to enable the towns to clean up and reset for the next day’s onslaught. Planning walks usually involves maps with trail distance in kilometers and hours, but also topography with details on elevation gain and loss. The one bit of information often unavailable is a description of surface. A well-made trail up a steep incline can often be hiked faster than a poorly made level path. The Floating Piers has no elevation change. It is a two-dimensional plane perfectly level with the surface of the water, its colors forming an abstract diagram to be seen from above. Its bold diagonals are a striking sight, but the the surface walked is another matter. It is hard to describe the sensation of crossing. It is a flexing, forgiving surface that enables walking in any footwear (or with none at all) and the map provided does not so much guide as it abstracts. Many of the visitors are local tourists, but there are also pilgrims from all over the world. Walking there is to hear a cacophony of languages and experience a cacophony of walking styles. Seasoned trekkers tend to move rapidly and directly, always aware of where they are on a trail and when in high traffic areas paying close attention to the movement of others. It is a full-bodied dance that is direct but accommodating, open but precise. In contrast, The Floating Piers is walked by a variety of people, each struggling to find their pace in relation to a crowd which moves to different rhythms or does not move at all (Selfie sticks have replaced trekking poles on this trail). The paths on the islands vary in width, but the floating bridges themselves are a uniform 16 meters wide. Covered in what they describe as a “simmering yellow” fabric, the walkway provides only one sense of directionality–across the lake and back. The surface itself is unmarked, giving no indication of where to walk. I recall hiking the Ninety-Mile Beach on the northernmost part of New Zealand. In that wide expanse of sand, I found myself unconsciously following any track that appeared–human footprints, tire marks, even the seaweed of the tide line–if only to find a sense of where and how to walk. Christo’s walkers are given a blank space. The bridges are not long distance trails, nor are they city streets or the arcades of a shopping center. They have a direction, but give their walkers no directions. What is most striking about the project surface is that, like water, it is not a rigid plane. The piers flex, float, and move according to their own complicated pattern, one that is influenced by the movement of the lake surface, the wake of boats, and the wind, but also by the footsteps of the many walkers. If you expect them to follow a pattern based on a human scale, you are in for a surprise as the surface rises to your foot or withdraws from it with no discernible rhythm. Consequently, the crowds moving in either direction (in or out) have to navigate the unpredictability of their fellow walkers and the chaotic flexing on the surface on which they stride. Perhaps it is the school-bus yellow, maybe the sharp and bold abstraction of its lines, or just the sheer child-like playfulness of the entire project, there is something about the Floating Piers that turns its users into children. It is a playful concept, but more fundamentally its users, like toddlers, must learn to negotiate the surface where they walk and the people with whom they share that surface. The day I walked the Floating Piers, I got to tiny Isola di San Paola (the most playful section of the project) to find a pontoon workboat floating just off the yellow fabric coast. Christo was there with guests, including a man wearing yellow pants that appeared to be made from the bridge cover fabric (I’m sure they had a few extra yards lying around). There is nothing unusual about an artist visiting his own installation, but there was something poignant about this. Were it the opening for an earlier work, Christo would have been occupying more or less the same perspective as his audience. Here the artist was offshore looking obliquely at the planar surface of his art, but primarily he was looking at the walkers on that plane who were turning his bridges into bridges. The floating piers are just beautiful abstract surfaces on the lake surface until the walkers arrive. Then the paths become paths, the toddlers learn to walk, and a new, albeit temporary, community is formed. Footpaths are humanity’s first writing, producing marks on the land that tell others where to go, and they, by going, create community. Paths exist through use. Christo’s are temporary and the community of walkers formed is transient, but the lesson remains. Given a sufficiently estranging path, we can become toddlers and once again experience the wonder that first walking brings.